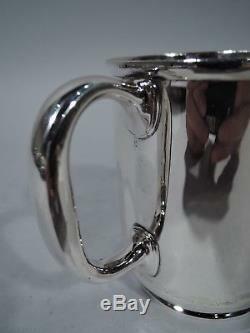 Edwardian sterling silver baby cup. 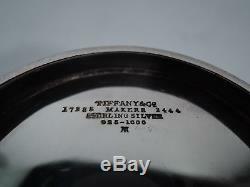 Made by Tiffany & Co. In New York, ca 1909. Straight sides, raised and inset foot, and c-scroll handle. Lots and lots of room for engraving. 17285 (first produced in 1909) and directors letter m (1907-47). 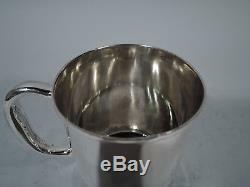 Dimensions: H 3 1/2 x W 4 x D 2 3/4 in. Weight: 5.3 troy ounces. 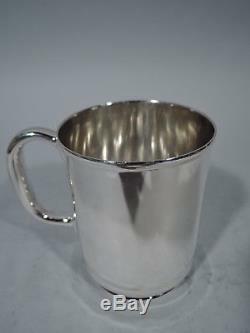 The item "Tiffany Mug 17285 Antique Christening Baby Cup American Sterling Silver" is in sale since Friday, January 19, 2018.